JVC Victor has announced a new audio system that will work with the iPhone and iPad that will hit Japan first. The new audio system has some really cool features and comes in several colors. The device comes in two versions that share almost all the same features. The UX-VJ5 has a CD player built in and the UX-VJ3 lacks that CD player. All the other features between the two systems are the same. 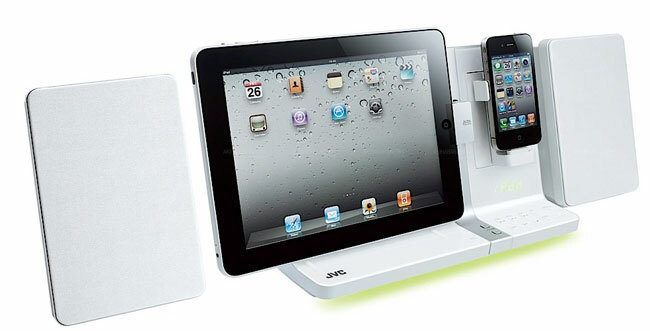 Those common features include the ability to dock both the iPhone and iPad at the same time for charging. The system will play tunes from those devices and has a FM tuner integrated. The CD payer version hides the CD door behind the iPad. The system has dual speakers each with 15W of power. Both of the products have audio inputs and video outputs to hook to your TV or larger computer screen. Another cool feature is that the VJ5 has a USB port and can rip your CDs to MP3 and shoot them to an external HDD. Pricing is unknown, but the devices will hit Japan at the end of July or beginning of August.